Lock in a great price for Hôtel & cie – rated 9 by recent guests! Room was clean and new, with comfortable furnishings in a modern style. Everything inside is new and good quality, quiet environment and comfortable room. very comfortable beds and everyone met our needs and were so friendly. we were snowmobiling and would definately stay there again. In fact my husband has stayed there with friends often. great location. Laundry available if needed. Gas station, liquor store and restaurant across the street. Very convenient when traveling by Snowmobile. Great breakfast with the room. The property was very clean and nice. staff pay very close attention to customer service to make you feel welcomed and at home. the bed was the most comfortable i’ve slept in my entire life, honest to god. Hôtel & cie This rating is a reflection of how the property compares to the industry standard when it comes to price, facilities and services available. It's based on a self-evaluation by the property. Use this rating to help choose your stay! 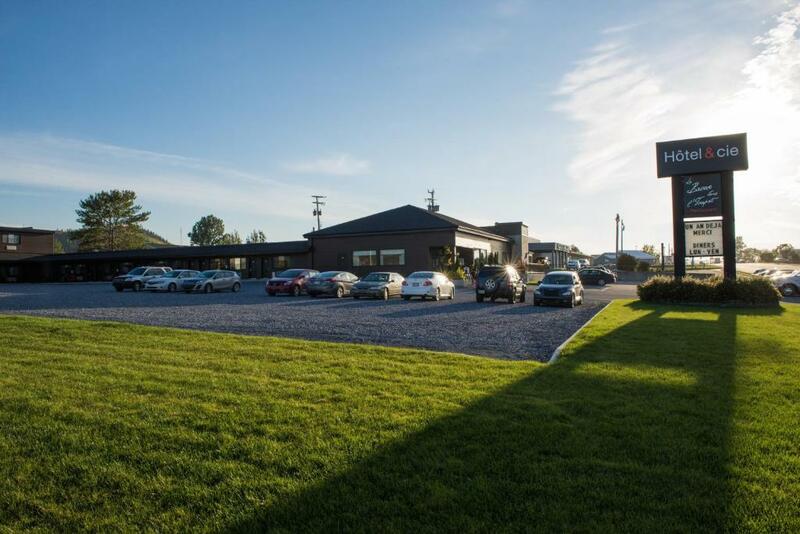 Hôtel & Cie is centrally located in Sainte-Anne-des-Monts and features an on-site restaurant. Free WiFi access is available. A 39-inch LCD TV with cable channels, air conditioning and a coffee maker are included in each room. The bathroom is equipped with a hairdryer. La Broue dans L’Toupet Restaurant serves dinner. Grilled meats, fish and seafood are among their specialties. Hôtel & cie Sainte-Anne-des-Monts also offers free on-site parking. Ski Chic-Chocs is 27 mi from this hotel. Le Gaspésien Golf Course is 2.5 mi away, and Center de plen air de La Haute-Gaspésie is 3.7 mi away. This property is also rated for the best value in Sainte-Anne-des-Monts! Guests are getting more for their money when compared to other properties in this city. When would you like to stay at Hôtel & cie? This room features a flat-screen TV and coffee maker. This room includes a flat-screen TV and coffee maker. It also features a modern bathroom with glass shower or bath and shower combination. This room includes a fridge, coffee maker, flat-screen TV and a bathroom with glass shower. Easily accessible on the web and downtown of Sainte-Anne-des-Monts, Hotel & cie offers the comfort of a city hotel close to the activities and services. House Rules Hôtel & cie takes special requests – add in the next step! Hôtel &amp; cie accepts these cards and reserves the right to temporarily hold an amount prior to arrival. Hôtel & cie accepts these cards and reserves the right to temporarily hold an amount prior to arrival. The mattress was not in very good shape. Couldn't get into restaurant either night despite being half empty. the room was a bit damp. I'm sure it was from the humid weather. The AC could have been put on sooner. Great presentation of hotel at the reception area. The staff spoke good English and were so helpful. Clean, modern facility with an amazing restaurant on site. All staff are friendly and helpful. Short walking distance to the beach and boardwalk. Also a great chocolatier close by! Found the beds uncomfortable. Difficult to converse with most staff in English. Bi-lingual staff required. Outside looks not very pleasant, part of the building is in construction.